Hello again my friend! I’m back today with an information-packed post for a recipe that can be notoriously tricky: cream cheese frosting! I have quite a few great frosting and filling recipes on this site. Some of my favorites include this chocolate Swiss meringue buttercream, this classic pastry cream, and this bright and citrus-y lemon curd. But there are times when NOTHING but cream cheese frosting will do. Cream cheese frosting is the perfect accompaniment for red velvet cupcakes, hummingbird cake, and anything with cinnamon! It’s taken me years of trial and error to finally feel like I understand how to make cream cheese frosting that is fluffy, stiff, and good for piping. Many times, it can come out runny or soupy, and that can be disastrous! It can slide right off the sides of your cake, or even worse, cause the layers to slip apart from one another and topple right over! But now I really get it, and I’m here today to share everything experience has taught me. 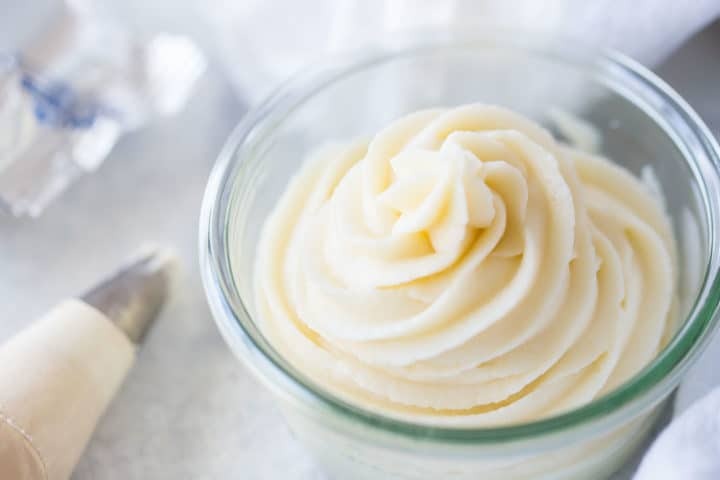 You only need a few simple ingredients to make cream cheese icing: butter, cream cheese, lemon juice, vanilla, and powdered sugar. But the way they are put together can make all the difference! Start with soft butter. To this, add 1 block of cream cheese. The cream cheese should be cold, but the butter should be at room temperature. Add the lemon juice and vanilla, and whip everything together until it’s smooth as can be. If you have any lumps at all when the next ingredient goes in, it will be nearly impossible to get rid of them. So do a good job on this step! Once the mixture is smooth and lump-free, add in about half the powdered sugar. Mix it in on medium-low speed, just until combined, then scrape the bottom and sides of the bowl with a silicone spatula, and add the remaining powdered sugar. When the last of the powdered sugar is mixed in, turn up the mixer to medium-high and whip the frosting until it’s really fluffy. As soon as you see that it can hold stiff peaks, you are good to go! I’ve had cream cheese frosting fail on me so many times! It can really be a bugger. But the more I experimented and played, the more I started to learn some great tips that can really guarantee a nice fluffy topping that’s stiff and stable. Here in the US, cream cheese is sold in 3 different forms: a brick, a spread, and a whipped spread. The spreads come in tubs and they are softer. The bricks are more firm. Bricks are best! They have the lowest water content, so you’re less likely to end up with a soupy or runny frosting. If you live outside of the US, I know that cream cheese can’t always be found in bricks. You can try to use cream cheese from a tub, but I can’t guarantee the results because the only tub cream cheese I’ve ever used has been American, and I have not ever had success with that. I always get the best results when I use soft, room temperature butter, and cold cream cheese straight from the fridge. 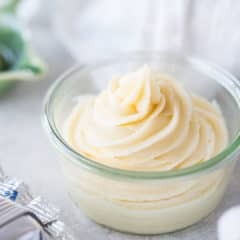 If the butter is too cold, the frosting can be lumpy, and if the cream cheese is too soft, the frosting can be runny. The whisk attachment is definitely the way to go! My paddle always gives me loose, soupy cream cheese frosting, but the whisk gets it nice and fluffy. It’s really easy to over-whip cream cheese frosting. The minute you see it starting to look fluffy and stiff, turn that mixer off! If it goes too long it can become a runny mess. If the butter is too cold, it can be really hard to get things smooth. Use softened butter that has come to room temperature, and beat it together with the cream cheese, lemon juice, and vanilla until it’s smooth as can be, before adding in the powdered sugar. This can happen if you use a low-quality cream cheese that has a higher water content, or if you use cream cheese from a tub instead of the kind that comes in a brick. Make sure to buy the best quality, full-fat, block cream cheese you can get your hands on. I’ve also found that cream cheese frosting can have a looser texture than I’d like, if I use the paddle attachment on my mixer. The whip attachment does a much better job of getting lots of air into the frosting, so it’s fluffy and stiff. Finally, if cream cheese is over-whipped it can break down and become runny. So, just as soon as you see it looking fluffy, light, and stiff, turn that mixer off and get right to decorating! CAN CREAM CHEESE FROSTING BE USED FOR DECORATING? While cream cheese frosting is not quite as stable as Swiss meringue buttercream or American-style buttercream, when made correctly it can be used for cake decorating. This frosting works really well under fondant. After the cake has been frosted smooth, chill it down in the fridge while you prepare your fondant. Then just lay it on top, smooth it out, and trim away the excess. When this cream cheese frosting is fluffy and stiff, it works really well for piping. But if you notice it’s getting too soft from the warmth of your hand, just chill it down in the fridge a bit, until it’s easier to work with. Because this frosting contains powdered sugar, it will crust over as it dries. 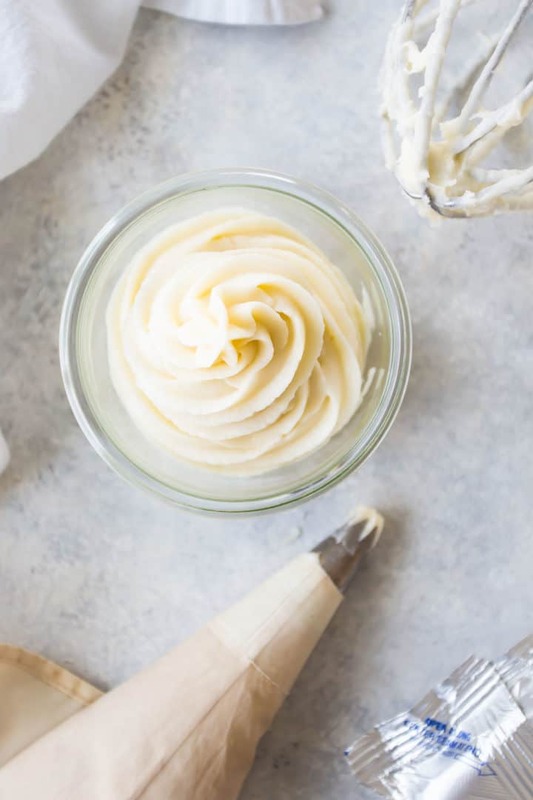 If you need something that does not crust over, try this Swiss meringue buttercream, this magical cream cheese frosting, or this whipped cream frosting. This frosting can be left out at room temperature for several hours to a day. Any longer than that, and it’s best to refrigerate it. I would not recommend freezing cream cheese frosting, as the freeze/thaw process can sometimes cause it to become grainy. Hopefully this information is helpful to anyone who has ever struggled with cream cheese frosting! Before I sign off, I’d like to take a minute to thank you for being patient with me these last few weeks. I know I have not been consistent with my posting. As I mentioned in my last post, we recently had a death in the family and it has me really shaken up. Losing my sweet little niece has really made me realize that we just never know how much time we will have with the ones we love. And right now, I’m trying to sort all that out and find a better balance between work and family. I appreciate the kind words I’ve heard from you. It makes me feel so good to know that you look forward to seeing my new recipes in your inbox. I will do my best to keep them coming! Place the butter, cream cheese, lemon juice, and vanilla in a large mixing bowl, and beat on medium-low speed until smooth. Scrape the bottom and sides of the bowl with a silicone spatula, and add about half the powdered sugar. Stir in the powdered sugar until combined, then scrape the bottom and sides of the bowl again, and add the remaining powdered sugar. Makes enough to frost 24 cupcakes, 1 triple-layer, 6-inch diameter cake, or 1 double-layer, 8-inch diameter cake. This is nice to know. I made cream cheese frosting a couple of years ago and it was so runny. I was so disappointed I have never tried it again. Everyones looked so creamy and thick but not mine. I always had the same problem Charlotte, but I was determined to conquer it! Hope these tips work as well for you as they have for me. 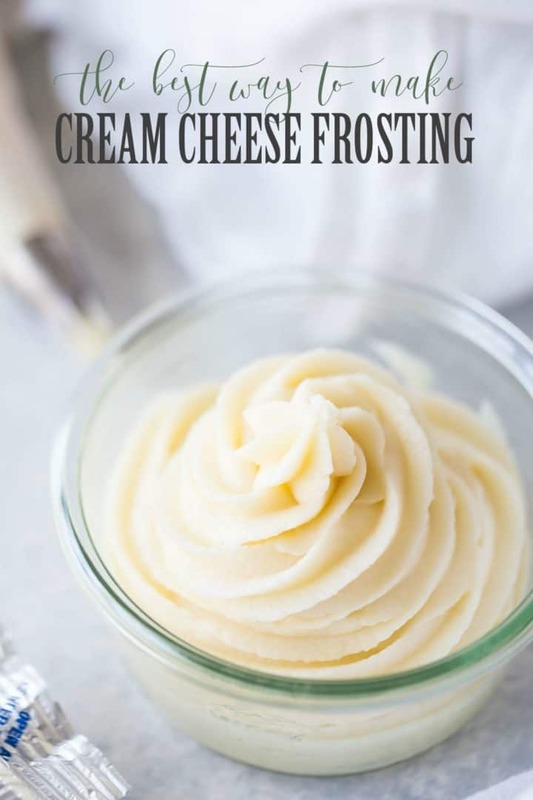 This is my all-time favorite cream cheese frosting! What happens person don’t like lemon. What can I use.? This is not a lemon flavored frosting. The lemon juice serves to bring out the flavor of the cream cheese. So for everything looks great. Hi there Emily! Thanks for the sweet compliment! For piping buttercreams I typically use Wilton as well. I prefer the featherweight bags that are reusable. I just wash them out with hot soapy water. The 16-inch size is my favorite for cake/cupcake decorating. For royal icing I use the 12-inch disposable kind, but I do reuse those a few times just to save on cost. And I like to encase the icing in plastic wrap first. You can see what I’m talking about in this video: https://www.youtube.com/watch?v=bGA8_Wj6opU. 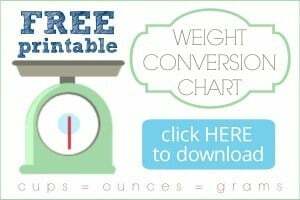 Hope this is useful info for you!